Christopher Sanchez Blogs: Inflation is Coming! Ok…many of you are aware that I predicted the Dow Jones Industrial Average would bottom around 7,200 pts while reserving the right to lower that forecast to somewhere in the neighborhood of 6,500. Well, here we are with the DJIA breaking below 7,200. Predicting the exact bottom is not possible! That said, I have decided that this level is not the right place to seek a new entry point in the stock market. I fully expect the DJIA to decline further and I honestly have no idea where this ends. Let’s get down to brass tacks for a minute. Simply put, inflation has been let out of its cage and cannot help but run rampant! 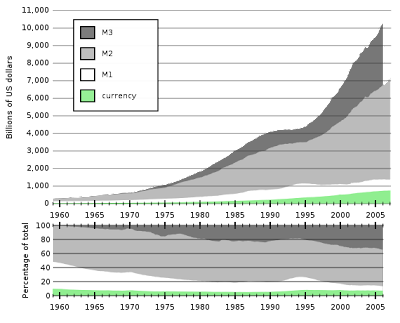 The expansion of the money supply is staggering! Friedman also famously said that deflation can be fought against by “dropping money out of a helicopter”. The behavior of the US Federal Reserve (by the way…the Fed is a private institution and is NOT part of the federal government) can best be understood by keeping Friedman in mind. Chairman Bernanke must be VERY afraid of deflation right now to be pumping so much money into the American economy. Now, why does this matter? Because if the Equation of Exchange is correct, inflation must increase! Generally, V is calculated from the values of the other components of the equation. As I stated, if this equation is correct, then inflation MUST follow the dramatic increase in the money supply. If I have bored some of my readers I apologize…sort of! The point to this is to warn folks about what I believe is coming and that it ain’t pretty! I'm sure though I hope I'm wrong! I really do hope the Fed manages to get this right but new rules of economics will be necessary. Do We Speak Well of the Gospel? Check Out My Archived Posts! Content Copyright 2018 © Christopher Sanchez. All rights reserved. Travel theme. Theme images by RASimon. Powered by Blogger.